A Bill of Sale Templates enables to legalize selling of properties, vehicles or equipment. They are widely used by both buyers and sellers to protect them from legalities. They help in recording various details of the property or vehicle including price. To complete the selling, one should raise a sales receipt which can be found by searching Google using receipt templates. They help in understanding the important legal issues and complete a deal with least hurdles. 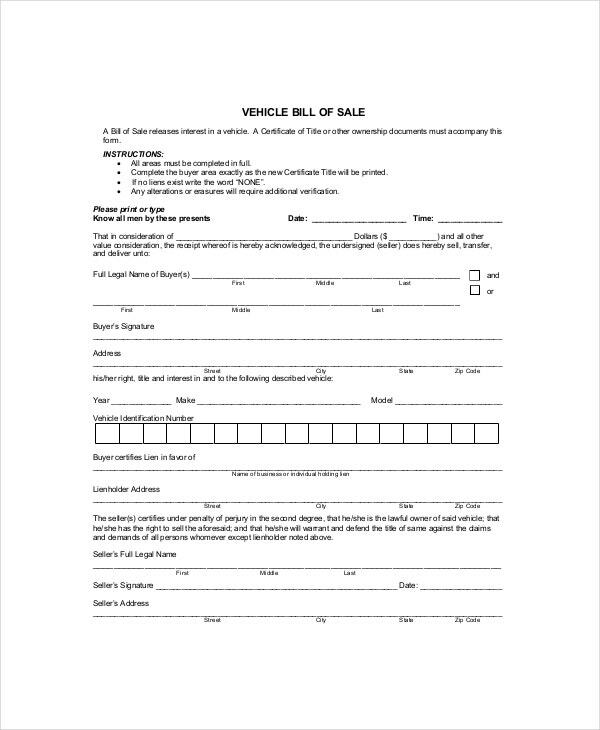 This vehicle bill of sale template presents seller’s information like name, address and vehicle information such as selling price, year of manufacturing, make, model, and type. It also provides names under which the vehicle is registered. 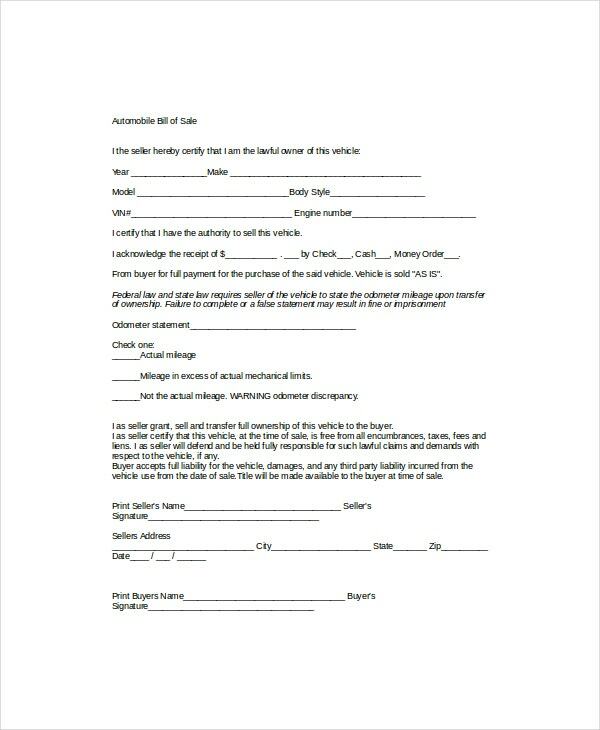 This auto bill of sale template provides details of the vehicle like year, make, model, style, VIN number and engine number. It also mentions the payment details, odometer reading and mileage details. 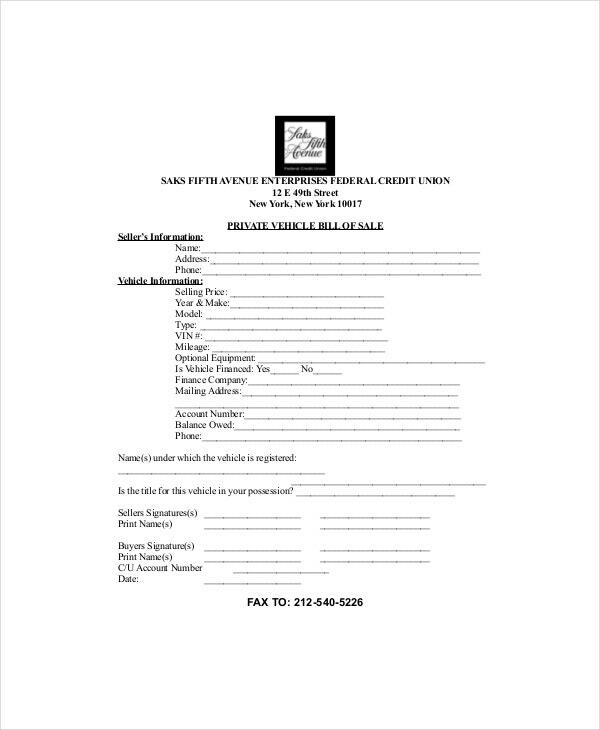 This car Bill of Sale Templates provides details like name and address of the vehicle owner, year, make, model, VIN number of the car. The payment details and time of sales are also recorded. 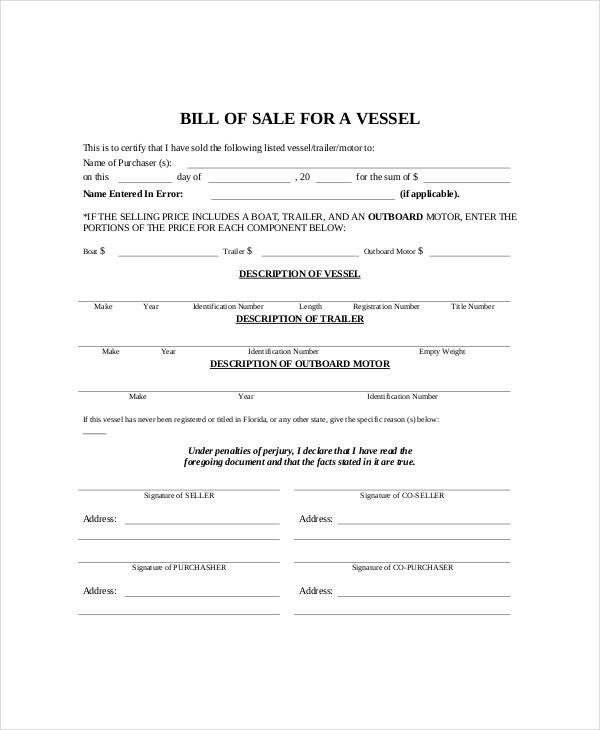 This boat bill of sale template presents purchaser name, bill of sale date, and amount received. The prices of components like boat, trailer and motor are also mentioned. Manufacturing details like make, and registration number for each component are presented. 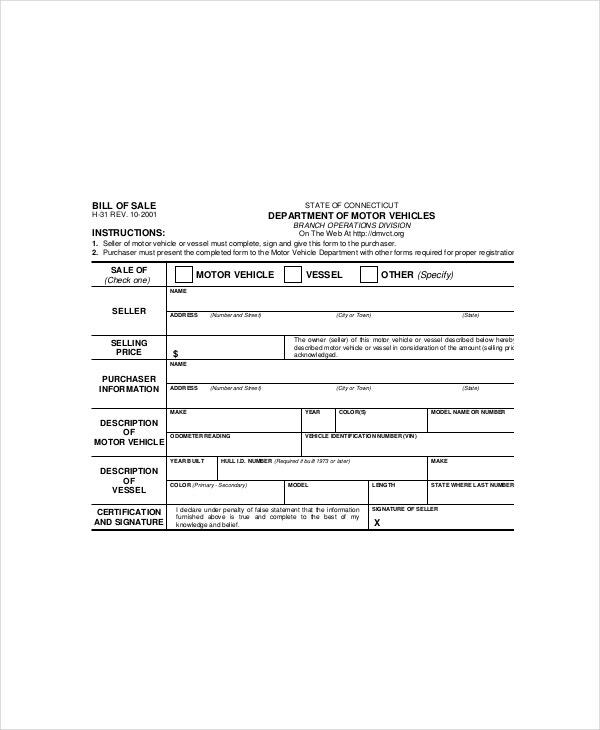 This generic bill of sale template provides vehicle information such as make, model, year, style, color and VIN number. It mentions the buyer and seller name and address as well as the agreed price for selling. > What are the Uses of Bill of Sale Template? They can be utilized for various purposes like selling of properties, vehicles, materials, and services as well. 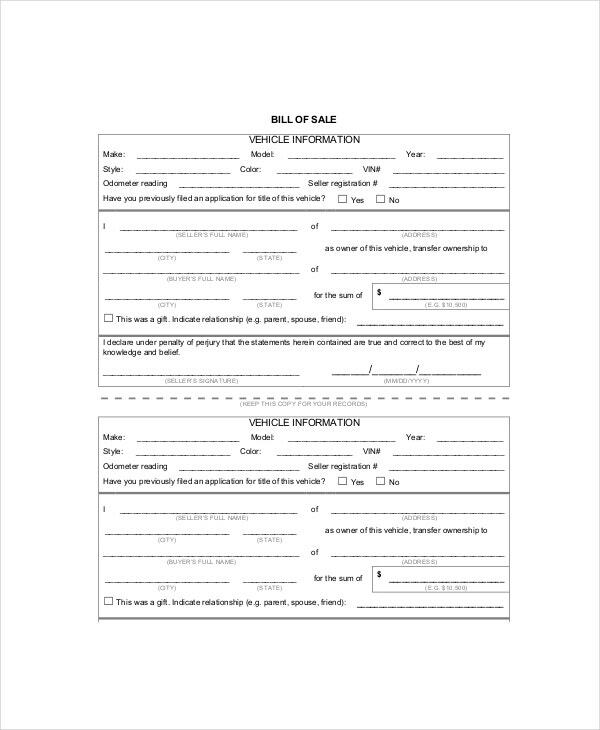 You can also see Bill of Sale Form. > What are the Varieties and Applications of Bill of Sale Template? 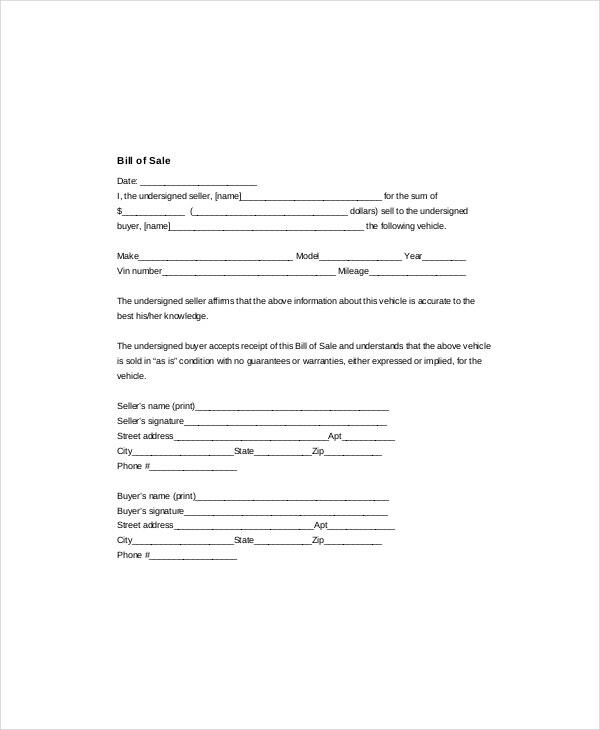 Bill of sale template is used during any sale transaction made between the buyer and the seller. They are extensively used in selling vehicles, properties, equipment like appliances, tools, etc., furniture and animals. For selling vehicles like a motor bike or car, the make, model, registration number, VIN number and mileage details are mentioned. For selling equipment or furniture, details like make, model, warranty details and condition are presented. For selling properties, they help in confirming the legal validity of the property documents and mention the price of the property as well. For selling animals like horses, they help in knowing the age of the horse and its health condition. > What are the Advantages of Bill of Sale Template? Bill of sale templates provide a lot of benefits to both buyers and sellers. For buyers, they help in knowing the proof of ownership, warranty details and legalizing the sales. For sellers, they help in legalizing transfer of property or vehicle and record the condition of the property. They also enable one to know legal procedures that are to be followed while making a sale. 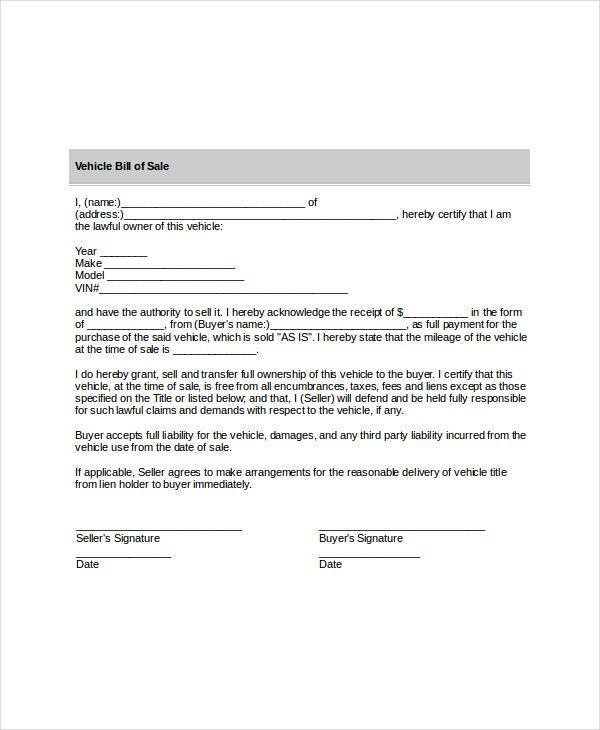 You can also see Auto Bill of Sale. They are authenticated by a notary and hence, they enable to legalize the sales. They also enable one to know the financial obligations, if any and mention those details. They help to acknowledge that the seller has complete rights over the property before making a sale. Bill of sale template comes in various varieties and one can choose them as per their requirements. They enable to satisfy both the buyer and seller to document the sales. They protect the buyers from purchasing vehicles or properties from unauthorized agencies or persons. They are invaluable documents for making a successful sale. 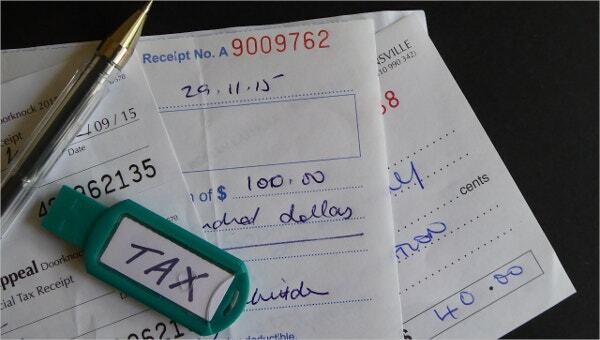 One can go through invoice templates to understand more about the bill of sale.